With the emergence of Facebook, Twitter, Pinterest, and all of the other popular social networking sites, many people have decreed that blogging is in decline. While social media might well be inspiring people to blog in a different manner to the traditional one, the reality is that blogging continues to remain strong with people all around the world. However, social media is not the only way in which blogging is evolving. As people are increasingly using mobile devices, particularly smartphones and tablets, they are using these products actively to blog on the go. The iPad is the bestselling tablet across the world, and one that is used widely by bloggers. 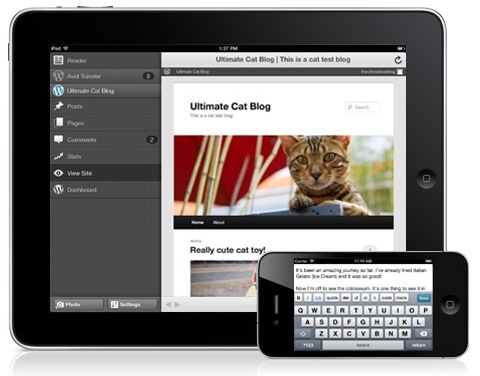 What are the top 5 iPad apps that can help bloggers produce their content? WordPress is the worldâ? ?s most popular blogging platform, owing to its ease of use and the manner in which it can be seamlessly integrated with almost any web hosting service to create stunning website experiences. The WordPress app can help bloggers to update their blog or website easily wherever they are, too. Just like WordPress itself, the app is free to download and use, meaning whether youâ? ?re simply conveying your thoughts to the world or you need to publish a breaking news story, you have the ability to do so quickly and seamlessly. While no one can take away the benefits of WordPress, if youâ? ?re a prolific blogger then Blogsy is an app you ought to consider. This is a paid app designed specifically for use on Apple devices, and it offers a huge range of features so you can add pictures, embed videos, and otherwise embellish your blogs in whatever way you see fit. All of these features happen via drag and drop, which is fast becoming the standard in all manner of online activities, with web design and development, as well as blogging, starting to rely heavily on this method. You can also schedule when you want posts to appear, and it also integrates easily with all of the big blogging platforms. Posts is an excellent app if youâ? ?re looking for an intuitive experience but donâ? ?t necessarily need the all singing, all dancing experience that Blogsy will offer you. Compatible with WordPress and Blogger, one additional feature of Posts is you can moderate and edit comments on the go, giving you the ability to manage your blog exclusively from your iPad, should you choose to do so. This is a great app for giving your blog the personal touch. How often do you find a website with a great font that you can never find for yourself? This app allows you to take a screen grab of any webpage, then tells you the fonts featured on the page, as well as instructing you how and where to download and install it onto your device. Have the blog you want and never have to use Comic Sans MS or Verdana again! Although there are a number of SEO plug-ins available for WordPress, if youâ? ?re using different platforms or have not used a plug-in, this app can help you to optimize your posts. After all, what good is your blog if no one can read it? While this is a paid app, it is unique in that it actually analyzes the content of your blog before telling you suggested keywords to blend in for supercharged optimization. If youâ? ?re already SEO savvy, then a free keyword tool might be a better option, but this can be a great way to bring traffic to your site, particularly if youâ? ?re trying to monetize your blog. Robert is an online business professional who runs regular seminars around the importance of high-quality blog content. Robert’s other areas of expertise include how to select managed VPS hosting services, identifying what makes a great webmaster, and how to save money on website development and design.